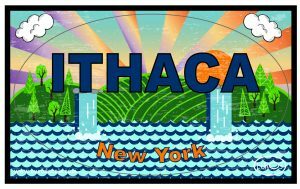 Stay tuned, Ithaca – we’re on our way! We’ve got eight new decal designs currently in house – including this postcard decal – with several more in the works. Our Chief Graphics Guru is from your neck of the woods and came up with some fab designs for you. We got so excited about patterns and texture that we almost forgot our classic roots. HA! The new designs will be uploaded to the Inventory section of the website this afternoon. Check them all out – we’re kinda proud.